Swedish Hill Winery was awarded with two gold medals at this week’s Florida State Fair International Wine Competition for two sparkling wines. Wineries from 30 states and several foreign countries entered a total of 629 wines in the 28th annual commercial wine competition in Tampa, FL which began this past weekend. 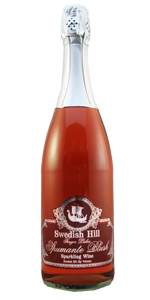 Swedish Hill’s sparkling Spumante Blush and Naturel each brought home a gold medal from this event. This is the first gold medal for the current bottling of the Spumante Blush, whereas it is the fifth for Naturel which also claimed a gold at the San Francisco Chronicle just last month. To see a complete list of Swedish Hill’s award-winning wines, click here. To read past news releases on awards won, click here.